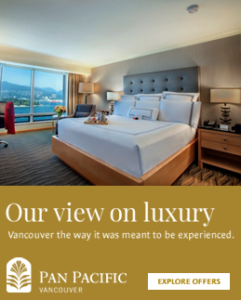 Have you had a chance to pick up Business in Vancouver’s Christmas edition yet? 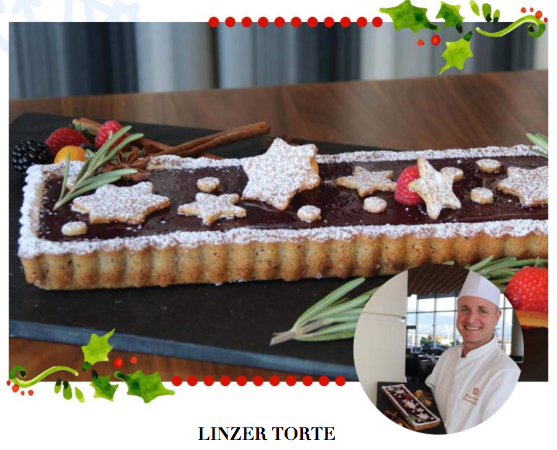 The complimentary magazine is chock-a-block full of Christmas gift ideas, events calendar, a walking tour, shopping guide, and holiday recipes, including one for linzer torte from our very own Executive Chef, Geoff Carkner! Add all dry ingredients in a mixing bowl and start mixing. Cut cold butter in small pieces and add to the dry ingredients while mixing. Add egg, mix just until dough comes together (don’t overmix). Rest doug 30 minutes in fridge. Take 2/3 of the doug and roll out to fit a 9-inch pie shell. Now spread lingonberry jam evenly on the dough leaving 1/2 inch border on the side. Take the rest of the dough and roll into strings and lace the top of the pie. Mix egg yolk and cream and brush on top of the lace and sprinkle with the silvered almonds. Bake at 170C for 50 minutes until golden brown. Once the torte cools, dust with icing sugar.